Could blockchain technology help the world’s poor? “Hernando de Soto, the Peruvian economist and anti-poverty campaigner, estimates that five billion people live without adequate records. They face serious challenges in documenting their economic activities, their assets, even their existence. This documentation failure denies them bank accounts, prevents them from borrowing against the homes they own, blocks them from access to insurance, and greatly weakens their bargaining position vis-à-vis anyone whose life, property, and business activities are legally documented. It’s a tragic global economic failure. Until now, de Soto has depended on political persuasion to try to address this problem, tapping a contact list of world leaders that reads like a U.N. General Assembly roll call. But now he’s getting help from new technologies that could fast-track the creation of permanent registries and give people manifest power to execute their property rights. One of the most promising solutions arises from open-source software called the blockchain that underlies digital currencies such as Bitcoin. Moving these people from the “informal economy” into the “formal economy,” when it has happened, has been an arduous undertaking. It entails the door-to-door drudgery of surveying and proving people’s property and identity, a challenge for governments that are often constrained by limited budgets and outdated systems. If the information is processed, it typically then resides in paper records that are prone to loss, disorder, and disintegration. And if it’s digitized, it’s in proprietary databases with formats that typically can’t interact with each other. All this makes it very hard to keep track of changes, such as the liens that creditors attach to property deeds. Such inefficiencies create such astronomical financial burdens that already-marginalized people and businesses frequently just opt out of the formal economy altogether. 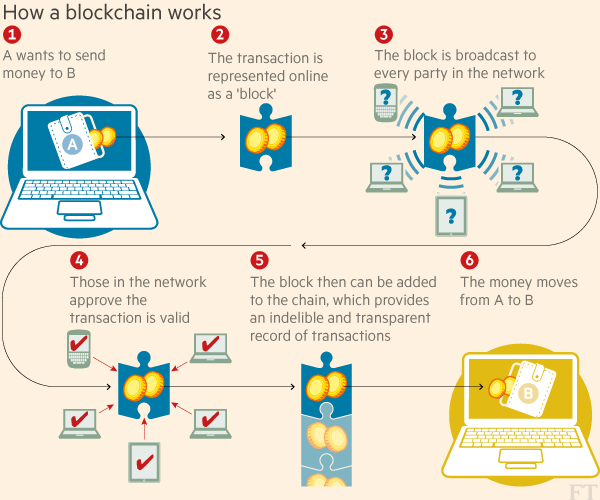 The blockchain offers a potential alternative. The independent computers that run Bitcoin’s decentralized network busily update and maintain an ever-growing public ledger of transactions. They repeatedly reach a consensus on changes and thus are constantly vouching for the ledger’s integrity. Information on new transactions is built on top of all preceding records in a precise, time-stamped, interlinked manner, which means anyone who tampers with past data will distort all other latter records and so expose their fraud. It is this permanance and incorruptability, combined with the fact that it is completely open and uncontrolled, that makes this new recordkeeping methodology so seductive. And the distributed nature of the blockchain ledger, which resides simultaneously on multiple computers, makes it far more secure than a centralized database. All these features make it possible for individuals to confidently and securely use the blockchain to make direct asset exchanges without relying on third-party intermediaries such as banks, lawyers, or notaries. While the technology was first developed for peer-to-peer currency transactions, innovators are now seeking to use the blockchain–either the Bitcoin blockchain or competing versions of it–for many other applications, including on claims to property title. Inserting metadata (data about the data) into blockchain-based transactions can create a robust, reliable record of all sorts of changing information. At the MIT Media Lab’s Digital Currency Initiative, where I work, we are exploring some of these uses for projects with social impact like the one championed by de Soto. And this exact application is being actively explored by the government of Honduras. It is working with Austin, Texas-based startup Factom to understand how it might use blockchain technology for land registration. The blockchain isn’t a magic bullet for the developing world. The technology is unproven and Bitcoin’s version of it faces scalability limits, among other challenges. Meanwhile, citizens still need government authorities to authenticate the input data on their claims to houses, cars, or personal identities. In slums, where criminal gangs often dictate who has rights to each piece of property, getting accurate and fair information poses an additional challenge. Still, once it’s created, the presence of an immutable blockchain ledger could help boost people’s confidence in public records. Financial institutions will be more willing to provide services if they can trust the data, de Soto says. Just as important, ordinary people might overcome their reluctance to cooperate with data-collecting authorities. In “The Mystery of Capital,” his bestselling book from 2000, the Peruvian economist argued that the absence of formal title to property meant there was $10 trillion in “dead capital” in the world economy–a tally of all the houses, small business assets and other property for which there are owners but no formal documentation. His Lima-based Institute for Liberty and Democracy has since updated its calculations to account for the foregone gains that people and businesses in the informal sector surrender to their counterparties in the formal economy. De Soto now puts the total figure at $20 trillion.